Hip pain relief can be pretty simple, in most cases. This page shows you how to get the do-it-yourself relief you've been seeking. The muscles in your hip area attach to your hip bone (ilium), your tailbone (sacrum), and your upper leg bone (femur). The general term "hip pain" means any of these attachments could be the cause of your pain, so we're going to free any inappropriately tight muscles in the area. The tennis-ball-press technique is a very powerful tool to release your hips. I love a good hip stretch, but nothing gets at and releases those specific areas of tension like this tennis-ball-press technique. It's pretty simple really. You just sit on a tennis ball or other ball you have handy, and notice where there is tissue that is painful and/or tender when the pressure from the ball pushes into it. All along the edge of your sacrum, up to top edge or your hip bones, out to the edge of your femur, all the way down to the tops of your hamstrings are where you'll be looking for tight tissue to release. Once you are comfortably relaxing into a tender spot, use press-hold-move technique to help the tissue release. Moving your leg......even a little bit......or tilting your pelvis back and forth are good ways to get that tissue under the tennis ball to move a bit and help it to release. Generally, you to apply as much pressure as you can relax into, and then move your leg enough so that you feel the tissue being pressed on by the ball move a bit. Keep moving your leg to make the movement happen and usually within 10 to 30 seconds you'll feel the tissue become less painful. That's how you know you've gotten a release. You'll want to make sure and do BOTH sides of your body and not only the side with the painful hip. How much hip pain relief this one technique provide? -if you feel this stretch in your knee then move your foot closer or further away from you until you no longer feel it in your knee. This technique targets pain that is specifically on the outer most side of your hip on the top of your leg bone at the outer most edge (femoral head, the greater trochanter). It definitely helps to see me work on it in the video and guide you, since the muscle is rather to tricky to get at. Please watch the last minute of the Step 1 video to see this technique. How much hip pain relief this one technique provide?. Many of the nerves that pass through your hip originate in the vertebrae of your lower back, so we want to make sure there aren't any nerves being yanked on in your low back that are causing your hip pain. This one stretch can often provide the hip pain relief you've been seeking. How much hip pain relief did this one stretch provide? Hip pain relief can also come from releasing the muscles of your upper legs. We'll be using the press-pull-release technique along with the hand-on-hand technique to get this important muscle to release. -now do the press-hold-move technique by working with the tissue like you're sculpting clay. Press, pull about a half on the tight spot, release. Then repeat, repeat, repeat. How much hip pain relief this technique create? We'll be releasing the tissue on the very side of your thigh and hip. The very long tendon called the iliotibial band and the muscle called the tensor fascia latae will be our targets. Just like in Step A in this video, we'll be using the press-pull-release technique and the press-hold-move technique to release these areas. At the very top of your hip in the muscle located between the top of your femur and the top of the side of your hip bone, you may also want to use the tennis-ball-press technique if the tissue is particularly stubborn. -lastly, do the tennis-ball-press on the tensor fascia latae if you need a bit more pressure than you can create with your fingertips. Assess how much this release helped reduce your hip pain. Best Hamstring Stretches is an entire video just on hamstring stretches, if you're interested. 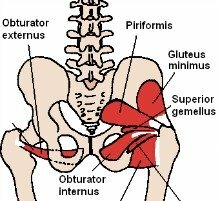 How much hip pain relief this hamstring stretch provide. Which techniques gave you the most hip pain relief? Was there one specific hip pain treatment that instantly relieved your hip pain? Are you still experiencing some hip pain? Investigate a bit and you'll eventually find which techniques work best for you to provide the best hip pain relief. Then you'll be able to fix yourself whenever you desire because you'll have your own personalized hip pain relief treatment……literally at your fingertips! If you're interested in more hip pain relief, you may benefit from any of the following techniques. Your hip joint pain relief may come anyone one of these. Once you find your way in, it's yours forever. The "tennis ball tune-up" (click here) to check out a great hip pain relief maintenance protocol. This lower back pain remedy with a massage tool is worth checking out if you like using massage tools.